Classic supernatural fiction is distinct from contemporary horror because it is more literate and often relies upon poetic subtlety rather than unpleasant gratuity to create atmosphere. This is one reason why it is highly collectible by connoisseurs of obscure literature. Most collectors are aware of such seminal if no-longer-read gothic classics such as Melmoth the Wanderer (1820), Frankenstein (1818) and The Castle Of Otranto (1765). However, the most important writers of supernatural fiction were Edgar Allen Poe and Joseph Sheridan Le Fanu, arguably disciples of the gothic form. Poe's first editions are very rare in their original state so collectors gravitate towards later illustrated editions. Harry Clarke's Tales Of Mystery & Imagination is perhaps the best, particularly the later 1923 edition featuring colour plates. Le Fanu's triple decker collection In A Glass Darkly (1872)--featuring the important vampire story "Carmilla--is equally unattainable, resulting in collectors seeking out later single-volume new editions. The stereotype of the traditional ghost story was, for better or worse, established during the latter part of the 19th by popular authors such as Mrs Riddell (Weird Stories, 1882), Rosa Mulholland (The Haunted Organist Of Hurly-Burly, 1891), Edith Nesbit (Grim Tales, 1893) and, of course, Charles Dickens. Although their stories possess an eerie charm they lack innovation. This changed in the 1890s with the advent of decadent 'fin-de-siecle' horror as practised by such luminaries as Vincent O'Sullivan (A Book Of Bargains, 1896), Arthur Machen (The Great God Pan, 1894) and M.P. Shiel (Shapes In The Fire, 1896). Decadent macabre poetry from this period is also highly collectible, in particular David Park Barnitz's The Book Of Jade (1901) and the volumes of Count Eric Stenbock, all fabulously rare. In 1904 M.R. 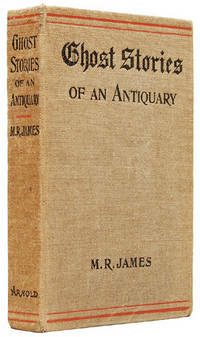 James published Ghost Stories Of An Antiquary and things changed once again. James dispensed with formal gothic trappings and purple prose, making greater use of personalised nightmare and commonplace phobias in everyday settings. James' work spawned many imitations including E.G. Swain's charming Stoneground Ghost Tales (1912) and the urbane Tedious Brief Tales (1919) by "Ingulphus." The ghost story flourished between the Edwardian period and the Second World War. Important collections from this period include E.F. Benson's The Room In The Tower (1912), A.M. Burrage's Some Ghost Stories (1927) and H.R. Wakefield's They Return At Evening (1928). More literate were the nebulous collections by Walter de la Mare such as The Riddle (1926) and On The Edge (1930). Algernon Blackwood, who produced a succession of highly collectible volumes including The Empty House (1906) and The Listener (1908), is also keenly collected. Occult detectives were extremely popular in the wake of "Sherlock Holmes," the most desirable collections being E & H Heron's Ghosts (1899), Blackwood's John Silence (1908) and William Hope Hodgson's Carnacki The Ghost Finder (1913). Hodgson was an important innovator of horror novels. Boats Of The 'Glen Carrig' (1907) and The House On The Borderland (1908) are highly collectible. The work of H.P. Lovecraft was also hugely influential. Of legendary rarity is The Shunned House (1928). Arkham House was originally founded to publish his collection The Outsiders and Others (1939). After the true-life horror of WW2 few writers of note turned to supernatural horror. One important exception is Robert Aickman, who co-authored We Are For The Dark (1951). Aickman was an intellectual and polymath, producing seven further original collections of "strange stories" including Dark Entries (1964) and Powers Of Darkness (1966). His work is literate, genuinely terrifying and highly collectible. The most collectible titles are attractively illustrated Victorian volumes and single author ghost story collections in dustwrapper from the 1920s and 30s. Christopher Barker is proprietor of Elegant Horrors Bookshop, a bookseller that specializes in supernatural fiction.